Although presently in its 64th year of publication, TV Guide might be said to be on the verge of becoming doubly obsolete. It is an out-of-date medium—the printed magazine—that provides information about another out-of-date medium, broadcast and cable television. But streaming television services like Netflix and Amazon Prime are only the most recent technological developments that TV Guide has had to weather, the increased availability of cable in the early 1980s being only one. 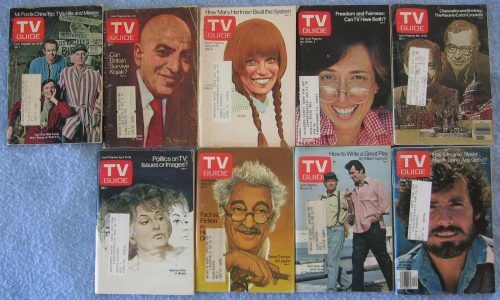 Televisual Time, organized by Assistant Professor of English Joel Burges, begins from the observation that the magazine itself is a rather fascinating document of television history. Its dimensions and heft have both grown and shrunk as the magazine has evolved from a thin, digest format to a thick, digest format and eventually to the thin, full-size format we know today. Between the covers, the listings themselves have also changed: the simple list format in the 1950s and 1960s expanded with the increasing quantity of channels and offerings in the 1970s, eventually leading to the introduction, dominance, and decline of the grid format. Black and white has become color, and local has become national, all shifts that parallel if not mirror shifts in television technology as well. With these observations in mind, this project formed around the questions of what a digital analysis of TV Guide—ideally on the large scale of distant reading—might tell us about the medium of television and, particularly, its way of structuring time. The magazine is a physical instantiation of that structure and, as a result, might be seen as a physical instantiation of time past. At the same time, it is itself already a kind of “distant reading” that operates on one far end of the spectrum Raymond Williams identified in the early 1970s between sequence and flow. For Williams, TV Guide might represent one of the institutions keeping “the concept of programming—the temporal sequence within which mix and proportion and balance operate—[still] active and still to some extent real.” Yet the magazine also introduces its own type of flow as one that proceeds across channels rather than along them: to look at the offerings in a certain time slot is to swim in a simultaneity not possible in actual televisual viewing, which only allows one channel to be watched at a time. TV Guide, in this sense, lays potential and opportunity bare, and in the most concise of ways. If switching through channels is surfing, reading TV Guide provides a fascinating coincidence of depth and surface that is perhaps also recognizable in the juxtaposition between the physical tactility of the magazine and the visual tactility of television, as Marshall McLuhan so influentially put it in the 1960s.